The coupe body form based on the S-Class has always been called CL-Class for some reason and I've always wondered why. Shouldn't it always have been called the S-Coupe for the sake of simplicity? Well with this current generation Mercedes-Benz have done just that, and now I'm wondering if it's fair to call it that. Because it neither looks like the S-Class, nor does it drive like it. 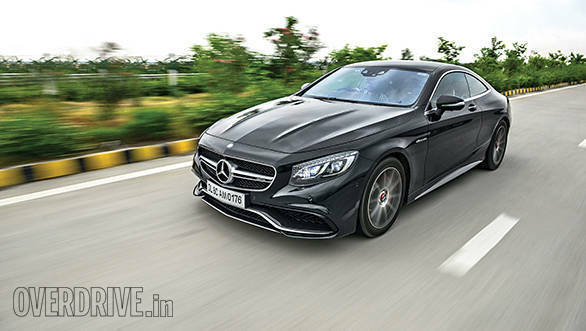 The S-Class Coupe is now in India in the form of the S 63 AMG Coupe and it has taken a mighty potshot at the S-Class' right to be called the 'best car in the world'. And its first argument is the way it looks. 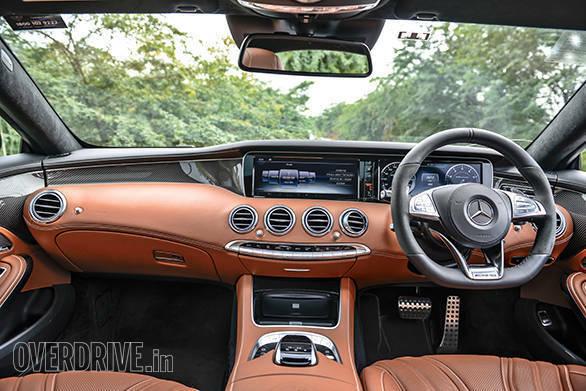 If you thought that the S-Class was a bit too stately and aloof, the way a luxury saloon is supposed to be, the Coupe brings exhilaration and zest to the design. The front is the only place where it manages any sort of resemblance to its roots, but look closer. The headlight unit is something of an art gallery centrepiece. If you're wondering what's so great about the intelligent LED projector lamps with DRLs and turn indicators, you've not looked close enough. The turn indicators and DRLs have 94 Swarovsky crystals embedded - 47 in each unit - 30 for each turn indicator and 17 for each DRL strip. On the downside, you're probably going to need to hire security just for the headlamps. As you move towards the side, you notice the fastback approach to the rear and the fact that the rear axle has been brought forward reducing the wheelbase by 90mm. I'll get to what that does to the rear seat space and ride quality a bit later, but what this gives the Coupe's stance are typically stunning GT proportions  long hood and short rear. The curves and contours feel more pronounced thanks to the frameless doors and windows, and the absence of the B-pillar. The S 63 gets the stunning 19-inch ten-spoke AMG wheels that barely hide the massive red AMG brake callipers. The back of the S 63 AMG Coupe is the best angle to look at it from. Number plates are usually the fly in the ointment for designers - the Mercedes boffins have moved the number plate to the bottom in the Coupe for a clutter-free tailgate design. Take it all together - the shapely LED tail lights, the recesses that allow the brake cooling air to escape, the faux quad pipes and the diffuser panel - and it makes you sigh in adulation. On the inside, they've taken away the best seats in the house - the captain seats at the back, and replaced them with small luxurious cribs for children. All of the focus, instead, is on the front seats  which even get their own hot stone massage function. 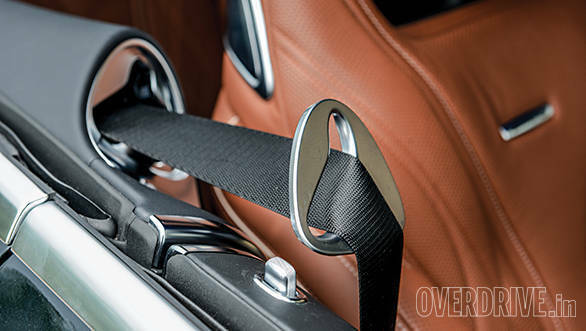 A robotic man Friday presents you with the seat belts when you close the doors, much like in the E-Class Cabriolet. The S 63 AMG also gets the Designo leather pack which lets you choose between four different leather options in brown, black, porcelain and crystal grey, each of which lends the interior a different character. You can complement your choice of leather with beautiful wood textures and lacquer. Once you're seated, you notice the special AMG exclusive steering wheel with perforations in the grip area and the massive high definition iPad like screen behind it. There's another massive iPad like screen almost integrated right next to it, which acts as a display for the flagship Mercedes-Benz infotainment system called Comand. 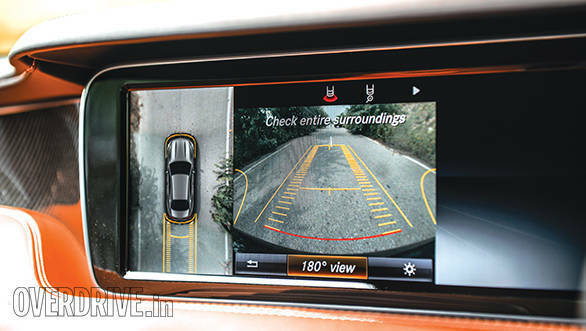 The Comand comes with built in navigation and Mercedes-Benz apps that can be operated either by the scroller, or the linguatronics voice system or an intuitive touch pad right above the scroller. The screen also displays visuals from the 360 degree parking and night vision cameras, of which the former is definitely handy. Mercedes-Benz have seen Rolls Royce's Starlight Headliner and raised them with their Magic Sky Control which basically transforms the sunroof from transparent to dark and tinted. It works on electrical voltage which aligns the particles in the sunroof to either let light through or block it. It also prevents the interiors from heating up a lot during the day, while at night it gives you a clear view of the stars. Now, I had said that the S-Class' Burmester system is the best music system in a production car and I've stood by it even after sampling other brilliant ones from Harman Kardon, Bang and Olufsen, Bower and Wilkins and their likes. So the S 63 AMG naturally benefits from it too - 24 speakers and 1520 Watts, and I haven't even gotten to the engine specs yet. The familiar 5.5-litre, twin-turbo, petrol V8 puts out 585PS of max power and enough torque to spin the earth the other way around. The 900Nm on tap offers relentless in-gear performance which the 7-speed MCT gearbox translates without breaking into a sweat. Mercedes have revisited an older technology with the MCT, but like with the C 63 before this, it performs rather well. 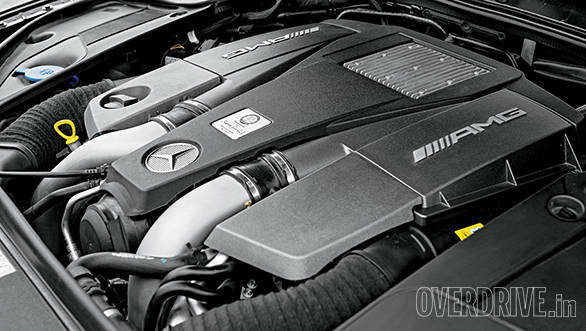 Noise, Vibration and Harshness (NVH) is non-existent, but give it the beans and you can hear the wonderful sound of AMG V8 orchestra courtesy exhaust flaps that open up when needed. The S 63 AMG is driven by its rear wheels as the 4Matic all-wheel-drive continues to be reserved for the left-hand drive S-Class'. The engineers have been able to shave off 65kg from the sedan with the extensive use of aluminium, composite brakes and lithium-ion batteries. 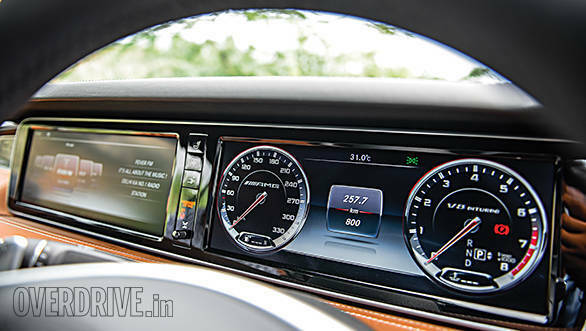 So despite being two-wheel drive and over 5 metres in length, the S 63 AMG does 0-100kmph in a staggering 4.2 seconds. Should that even be allowed? How does it handle all that power? Well, the first Mercedes was a racing car so one can understand what they want their machines to be like. 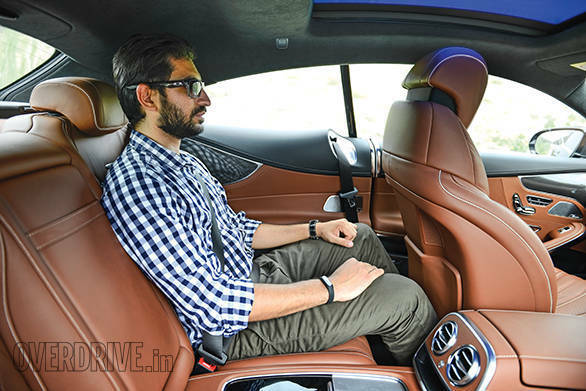 You simply cannot drive the S 63 AMG like a sportscar. You have to cruise in it like a classic GT car. Truth is, the chassis, steering and suspension tune out the feedback for comfort and luxury, and so they fail to communicate the limits. You can't turn off the ESP and I couldn't help but wish for just a bit more wheel slip. So you basically enter a corner, turn in, floor the throttle as you're exiting and wait for the traction control to grant you power as you take off the steering lock. It feels quite unnatural when you flick the car until you realise the technological wizardry at work. The S 63 AMG comes with Magic Body Control that gauges the surface ahead with the help of cameras and adjusts the active hydraulic suspension. It also debuts the Curve Tilting technology as part of the Magic Body Control, which as ludicrous as this sounds, leans the car into the corner like a motorcycle. What's that supposed to achieve? Do you open the door and get your knees down? Does it offer the S 63 AMG more grip through corners? No, the Curve Tilting function is more of a convenience feature than a dynamic one. The 2.65 degree tilt can't be perceived from the outside but on the inside it translates into negligible body roll and more comfort for the passengers. So you drive it like it's meant to be and the S 63 Coupe rewards you with incredible comfort as you cross countries and continents. There's nothing beyond the S-Class when it comes to luxury and there's no one you'd rather turn to for performance than AMG. Make it twice as good looking and you have a car that might have a stronger claim to the title of 'the best car in the world' than the car it is based on.